Lowering kit for Triumph Sprint RS for bikes with double sided swing-arm only. Rear suspension lowering kits for Triumph Sprint RS models. Reduces the ride and seat height. High quality lowering kits manufactured in steel by Lust Racing in the UK. These lowering kits are made to last the lifetime of your Triumph Sprint RS with double-sided swing-arm. NOTE: This kit will NOT fit Sprint RS or Sprint ST models with single-sided swing-arm. Manufactured of roll-forged high tensile steel, finished in black powder coating for excellent wear and corrosion protection. Lust Racing lowering kits are supplied complete with easy to follow installation instructions. Lust Racing suspension kits contain two suspension links replacing the standard suspension tie-rods on the Legend TT lowering the rear suspension. The lowering is measured at the upper surface of the seat vertically above the rear axle. Select the correct suspension kit for your bike model from the list below. 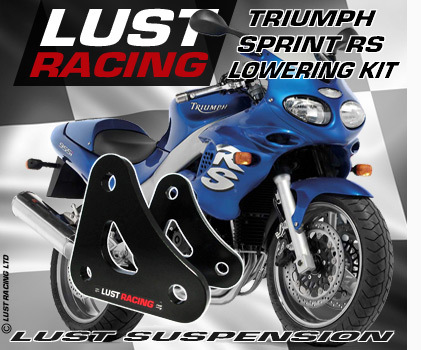 Lust Racing lowering kits will lower the seat height and the ride height of your motorcycle. The lowering kits on this page fit Sprint RS models manufactured years 2000, 2001, 2002 and 2003 with double-sided swing-arm ONLY.